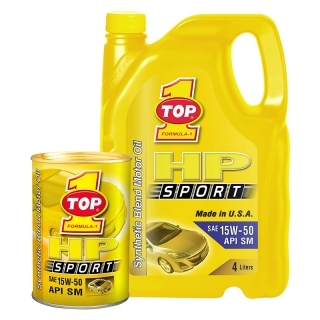 HP SPORT 15W-50 is a superior quality synthetic blend motor oil formulated with our highly advanced additive package. Its high oxidation stability protects the engine from oil thickening, high temperature sludge, viscosity breakdown, and varnish deposits. It is fortified with detergent-dispersants and rust and corrosion inhibitors to keep engines exceptionally clean and free of sludge, varnish, and rust. HP SPORT 15W-50 is designed to provide unsurpassed driving performance in high traffic city conditions as well as in high-speed highway conditions.